Every person has about 2 million sweat glands distributed all over the body. They produce an aqueous salt solution which is odourless at first. The typical body-odor is produced only subsequently by the bacterial decomposition of sweat. It develops mainly whereever there is a damp warm climate and the sweat can not evaporate quickly (e. g. armpits, genital area). Of course other areas of the body also produce sweat but it can evaporate here before the bacterial decomposition of sweat begins. Therefore it is very important to avoid unpleasant body odour, especially when you are among other people. In our silver deodorants we use the disinfecting power of silver, which prevents from the reproduction of odor-causing bacteria and so avoids the typical smell of sweat. Effective against sweating - provides a reliable fresh feeling. Effective against sweating - provides a reliable fruity-fresh feeling. Effective against sweating - provides a reliable woody-tangy feeling. 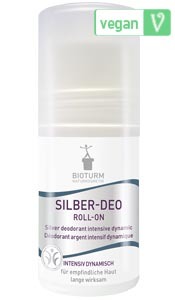 Our proven Silver deodorant INTENSIVE is now also available as pump spray: with the effective power of silver against odour-forming bacteria. Our proven Silver deodorant INTENSIVE fresh is now also available as pump spray: with the effective power of silver against odour-forming bacteria. Our proven Silver deodorant INTENSIVE dynamic is now also available as pump spray: with the effective power of silver against odour-forming bacteria. Acts antibacterial against odour-forming bacteria through pure silver - mild and particularly well tolerated. With a delicate fresh fragrance. 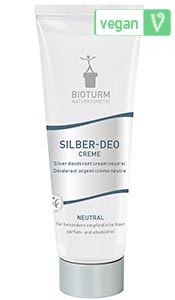 WITHOUT alcohol and perfume for especially sensitive skin and allergic persons. 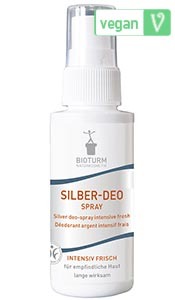 With pure micro silver against odour-forming bacteria.